In the War on Poverty America of 1964, the nation’s rich loomed as far less potent players than they do today. 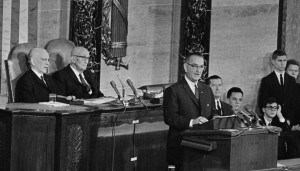 Exactly a half-century ago, in 1964, a President of the United States announced a “war on poverty.” That war would soon dominate the nation’s domestic political discourse — and make a real difference. Over the next 10 years, America’s official poverty rate dropped from 19 to 11.2 percent. But that progress against poverty stalled in the 1970s, and a profound economic insecurity now afflicts the vast majority of Americans, poor and middle-class alike. Households in America’s most affluent 1 percent, meanwhile, have more than doubled their share of the nation’s income. Against this backdrop, our current President has now declared inequality “the defining issue of our time.” Top Democrats, news reports shout, are moving to make inequality the centerpiece of the 2014 elections. Even some GOP pols are jostling to show they care about how unequal America has become. America has changed. Our growing concentration of income and wealth has left the nation a fundamentally different place. 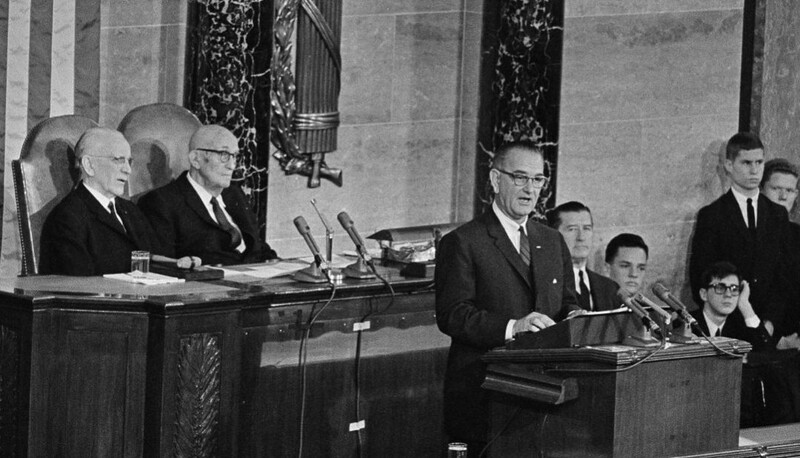 Back in the 1960s, the rich had no chokehold on America’s democratic process. Today they do. America had rich people, of course, back in the 1960s. But we didn’t have all that many of them. And those rich we did have had far less wealth than their counterparts today — and far less capacity to create political mayhem. How much less capacity? Let’s look at just the richest of our rich, our top 400. Forbes magazine didn’t start publishing annual tallies of the wealth of America’s 400 richest until 1982, and IRS stats on the nation’s top 400 annual incomes only go back to 1992. But we can recreate from earlier IRS data reports some top 400 income totals for assorted years before then. In 1961, for instance, IRS records indicate that the nation’s top 400 had incomes that averaged just over $2 million. These taxpayers, after exploiting every tax loophole they could find, paid 42.4 percent of their total incomes in federal tax. After for inflation, our top 400 in 2007 grabbed 25 times more income than their top 400 counterparts in 1961 — and 36 times more income after taxes. In actual dollars, our top 400 in 2007 — after taxes and inflation — had $112 billion more sloshing around in their pockets than the top 400 of 1961. We don’t have top 400 income data from the IRS yet for 2013. But all signals indicate that our wealthiest have weathered the Great Recession quite nicely. Our hedge fund and private equity kingpins are once again pulling down pre-recession-level jackpots, and last year, for the first time ever, the nation’s top 10 corporate CEOs all realized over $100 million each in compensation. Where are today’s super rich putting all this loot? A good bit of it is cascading into politics. In 2012, the Washington Post reported last week, the billionaire Koch brothers and their allies stuffed “at least $407 million” in politically active nonprofits that didn’t have to disclose their donors. All those millions came above and beyond the cash the Kochs and other billionaires funneled directly to candidates and political campaign committees, contributions that had to be disclosed. Billionaires like the Koch brothers and Sheldon Adelson underwrite the most rabidly right-wing of America’s political players, those candidates and causes devoted to ending any and all obstacles to the ever greater concentration of America’s income and wealth. But other billionaires – the Wall Street financial crowd and the corporate executive elite — have been mobilizing, too, in outfits like Fix the Debt, a pressure group for budget austerity. These wealthy powerbrokers present themselves as far more enlightened and “public-spirited” than their hard right-wing counterparts. They don’t deny or celebrate inequality. They’re maneuvering instead to limit how the nation responds to inequality — to make sure that any response leaves their wealth and power essentially intact. These billionaires, unlike their hard-right brethren, can tolerate temporary extensions of jobless benefits. They cannot tolerate any serious move to tax their financial transactions, estates, and excess income, or any legislation that would restore to working Americans the basic right to bargain over the ample wealth the U.S. economy continues to create. So we have today two camps of the colossally wealthy, one crazed and one calculating, both powerful, both controlling stashes of cash that tower over the resources the rich of the 1960s could bring to bear on the political process. Can today’s rich be beaten? Can we beat back their austerity and begin to make real — and not just rhetorical — progress against inequality? Bill de Blasio, the new mayor of New York, says he going to try. De Blasio pledged during his campaign to confront inequality head-on, and he’s calling Fiorello LaGuardia, New York’s Great Depression-era mayor, his inspiration. [toomuch_promo]LaGuardia and the popular movements that put him — and people like him in positions of political power — faced a rich and powerful just as rich and powerful as ours today. Over the middle decades of the 20th century, they sheered those rich and powerful down to democratic size, a victory that created the modern American middle class — and the much more equal America of the 1960s. LaGuardia and the movements around him made their rich less rich. We can, too.